You guys always seem to love Mexican food as much as I do (and by ‘Mexican food’, I mean the almost entirely inauthentic TexMex kind of food). My slow cooker burrito bowls are one of my most popular recipes ever. But, it’s been a while since I got my bean on (…that wasn’t meant to sound like a euphemism), so I thought it was time for another Mexican recipe. 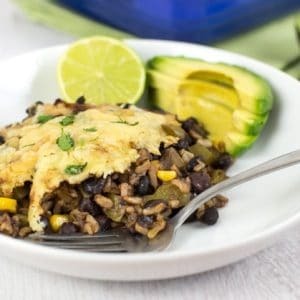 I suppose this black bean casserole is similar to a burrito bowl in many ways, but it’s lighter on the rice and heavier on the beans. Plus you get a crispy, cheesy topping – which has got to increase its appeal by at least three times, no? 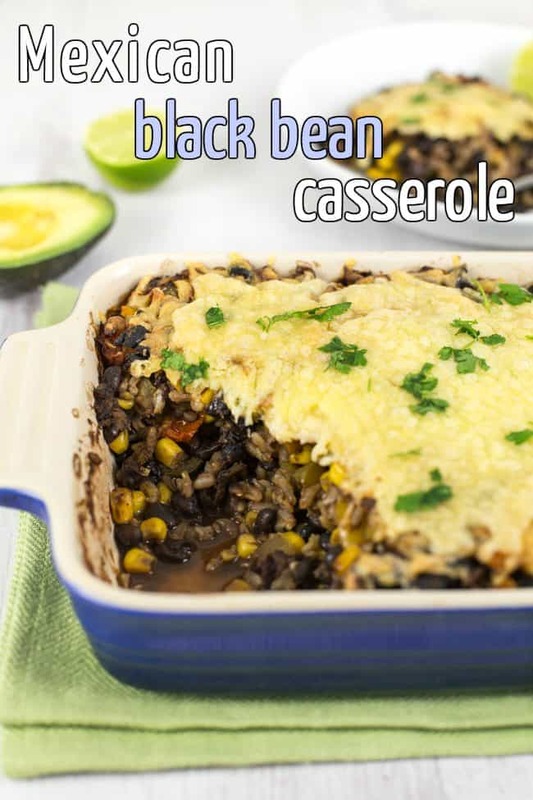 This black bean casserole is nice and easy to make, as all of my recipes are. The only thing that needs pre-cooking is the rice – I used brown rice, so I could justify having an entire bar of chocolate for dessert. Once you’ve cooked that (the rice, not the chocolate), just mix everything together in a big bowl, then bake it. If you want a one-pan dinner – I salute your laziness – you could use leftover rice instead, and mix it all together right there in the casserole dish. Feel free to throw some extra veggies in there as well, if you like. I added red and green peppers, tomatoes and sweetcorn, because I can currently stomach those, just about! But you can add whatever else you fancy. I’d just say that if you’re using any particularly hard veggies or anything that needs to be cooked quite thoroughly, you might need to pre-cook them before adding them to the casserole. Then just serve your black bean casserole alongside some sliced avocado, salad, or a dollop of sour cream (or all three! ), and you’re good to go. Boil the brown rice in plenty of water until cooked to your liking (around 20 minutes), stirring regularly. Drain, and add to a large mixing bowl. Add all of the remaining ingredients to the bowl, except for the cheese, and mix well. Transfer to a suitably sized casserole dish. Sprinkle the grated cheese over the top, and bake for around 45 minutes. If you'd prefer gooey cheese rather than crispy cheese, cover the casserole loosely in foil before baking. 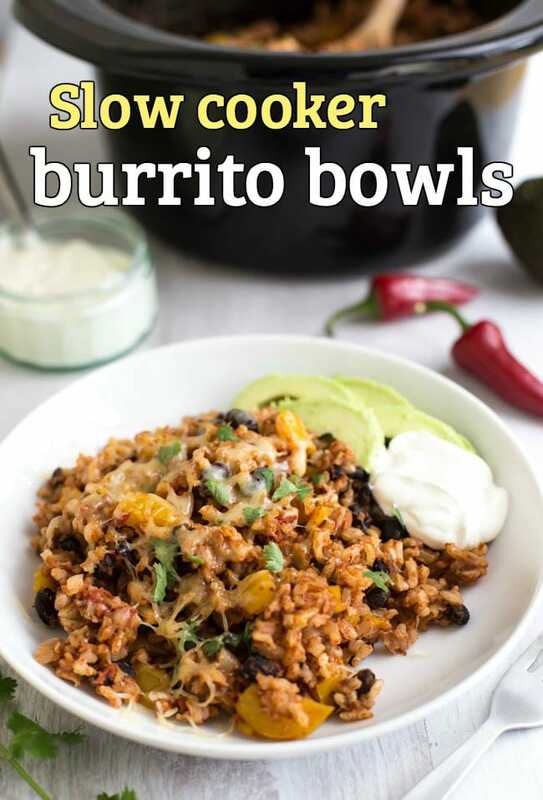 Prefer the sound of my slow cooker burrito bowls? They’re super popular and there’s no pre-cooking required! This was amazing and so easy to make!! Mexican foods are awesome. My favorite Mexican foods are Mexican corn and Mexican Tacos. This recipe is really healthy and I am going to try this tomorrow. :) Shared it via twitter. I made this tonight. 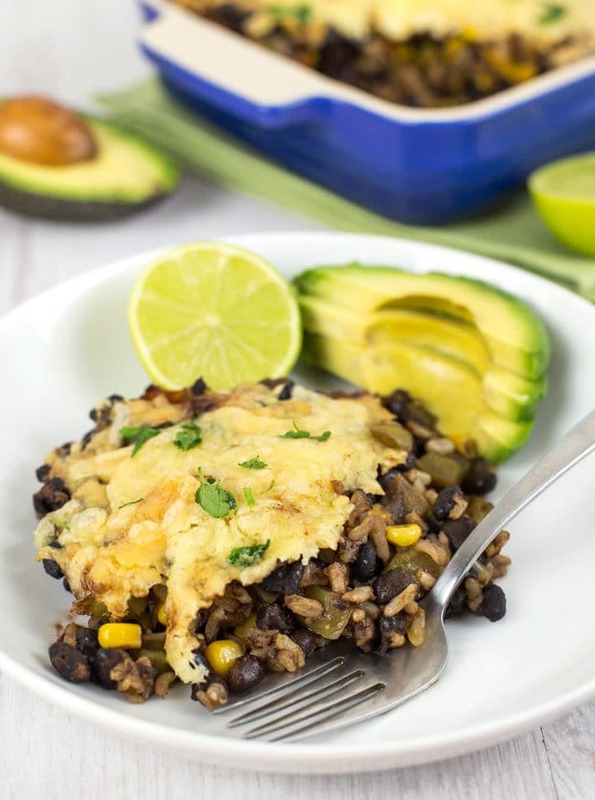 It was nice – but I substituted the black beans for kidney beans and cannellini beans. I think I’d be inclined to add the cheese at the end as it all sort of melted into the meal and vanished over the 45 mins in oven. Also I think I’d probably add a load of spring onion and garlic to it if I was to do it again. I’d almost be trying to get the vegetable burrito bowl flavour going. I think it really benefits from the sour cream on the side. I’d also use some guacamole next time. Without those tweaks I think it’d be a bit bland for my taste. But it’s great energy food either way. Also I fed my girlfriend and I and there is still enough for lunch tomorrow. Not bad at all. I dont think this will be a definite meal I’ll cook again, but I’m curious to try it like I mentioned above. It might be more to my taste that way. Thanks for the recipe. I love this site. Onion and garlic would be good additions – I didn’t add them this time because I’m pregnant, and onion is one of the only foods that I’m still having trouble stomaching – but they would be good! Mmmm, proper hearty comfort food, this! I do believe there are a couple of tins of black beans in my cupboard too! Oh I was just thinking few minutes ago about how I love Mexican foods. 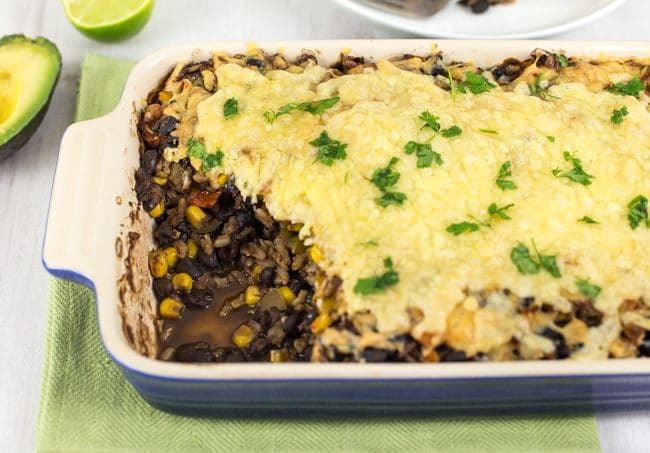 And this is a lovely casserole with black beans. This looks great. As I’m doing two meat free days a week, I’ll definitely try this. I need to make those burrito bowls too, I’m sure I said that when you posted them, but they look so good! I just adore Mexican food, so simple yet complex flavours! My son walked in from school with a sticker saying ‘I tried something new today’. He was so proud… turns out the something new was a dish containing black beans. Wonder what his reaction would be to your recipe which looks totally delicious! 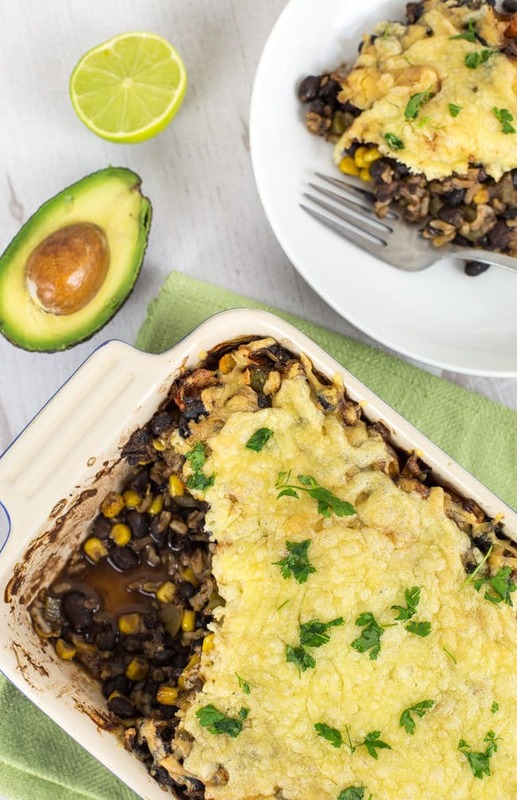 We enjoyed your Black Bean Casserole. I subsituted peas for corn and added garlic. I like garlic and add it often to almost everything I cook. Corn grown in the States is about 98% GMO and I’m opposed to it. positioned. You are truly a great stylist. This looks so yummy, thank you Becca! I will try this recipe soon. 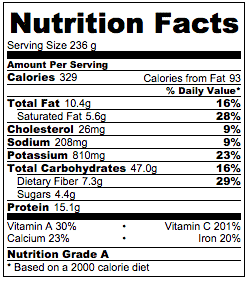 Thank you for the nutritional info but … how many does this serve?